...and glad that I'll never had to fly long-haul again with 2 under-4 year olds. I had thought that the flight out, with Monty screaming for most of the way and Hugo being sick all over my shirt and trousers, was the worst day of my life. But the past 24 hours, with the boys crying at regular intervals from 10pm onwards and then waking up for good at 2pm, was in some ways even worse. It fell to me to deal with them as the Kiwi, poor thing, was suddenly very ill about 30 mins drive away from our house yesterday. I've never experienced a "vomiting in taxi" moment before and so wasn't sure what the going rate is for a tip to cover cleaning - I gave the guy an extra £20 and he seemed ok. Grief - I've never been more glad to be home. When we visit NZ the Kiwi usually buys lots of clothes while I buy lots of books on colonial history. I acquired a large stash this time, as a result of various sales - James Belich's account of the 1868-69 Taranaki campaign; Paul Moon's biography of Hone Hiki and the first volume of his trilogy on the 1820-50 period; a couple of books by Matthew Wright on the inter-Maori "Musket Wars" and the NZ experience in WW1; Keith Newman's two books on the influence of missionaries in the first half of the 19th century; and one or two other things. I managed to have a game with Valleyboy and Captain Chook which I'll post about later. I'll have some photos of Maori stuff which should be useful for the NZ Wars, and of Kiwi trees and flora. But as always the trip was also all about the wine. There was an early disappointment when I saw that the Emirates lounge at Heathrow is now serving Veuve Cliquot champagne instead of Bollinger, which they used to do (although that said it was Veuve Cliquot 2004, which was pretty good). However, Emirates redeemed themselves on the return leg by serving an excellent Californian marsanne/viognier blend in Dubai - the Treana White from Hope Family Wines (Emirates always have a good US wine somewhere). In NZ I was pleased to see that rose wine is back in fashion (the best roses are made by Esk Valley, Elephant Hill, Black Barn and Cable Bay - all made from merlot and malbec rather than pinot noir; the latter is a common base for roses, particularly those from the South Island, but I don't think pinot really works), and I noted that there are many more NZ sparkling wines than before. 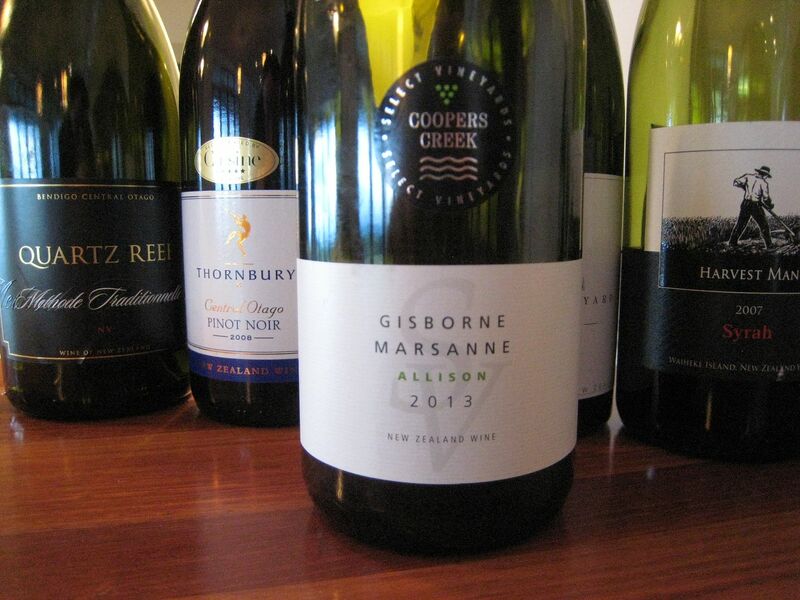 I also enjoyed being reacquainted with North Island sauvignon blancs - most of the NZ savs that are exported come from the South Island, particularly Marlborough which is where the classic "gooseberry and cut grass" wines come from, but savs from the North are more rounded, weightier and less "acidic" than their southern counterparts; that makes for a very pleasant change of style. Wineries of the trip were Two Paddocks and Gibbston Valley: not places that we visited as they are in Central Otago in South Island, but I've wanted to try their wines for years and finally managed to do so. 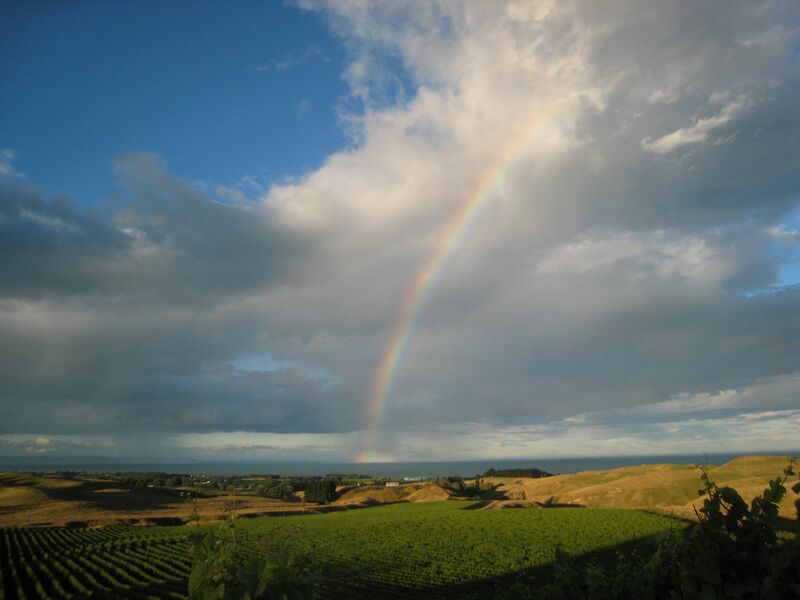 Two Paddocks is owned by the actor Sam Neill and Gibbston Valley was one of the first wineries to plant grapes in Otago. Both produce fantastic, but expensive, pinot noir. 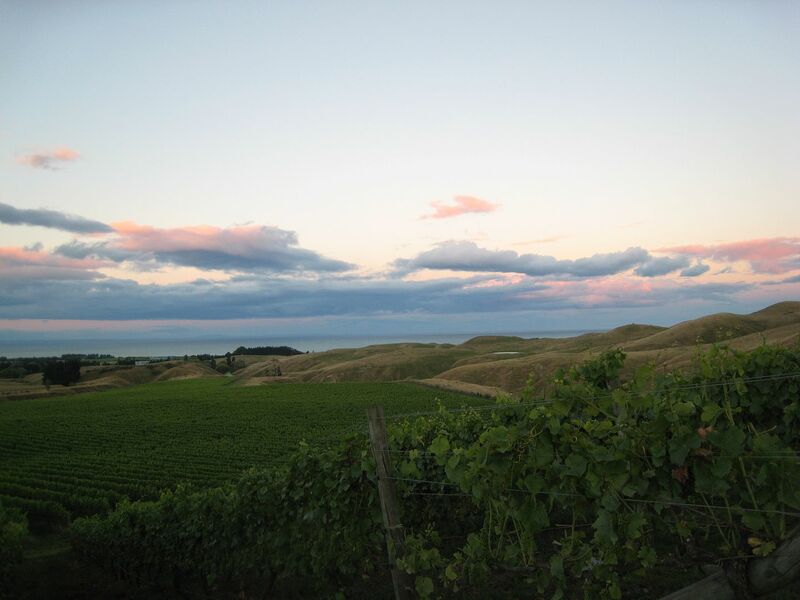 In Hawke's Bay I visited Crossroads, which is one of the wineries that my friend Malcolm Rose of the Ten Figures a Week blog represents in the UK. 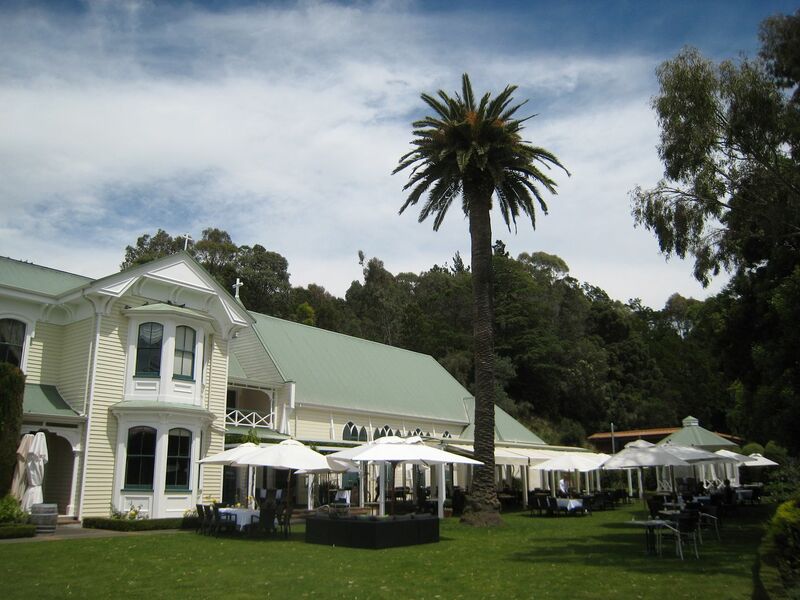 We also had lunch at Mission Estate (above left) which is where the Kiwi and I were married in March 2009. I had tasting flights at 15 wineries in total, although we visited a few more for lunch or dinner, and I tried (so had at least one glass of) 129 different wines in total; all carefully, and rather anally, written up in the tasting notes books that I have used for almost 10 years' worth of holidays now. 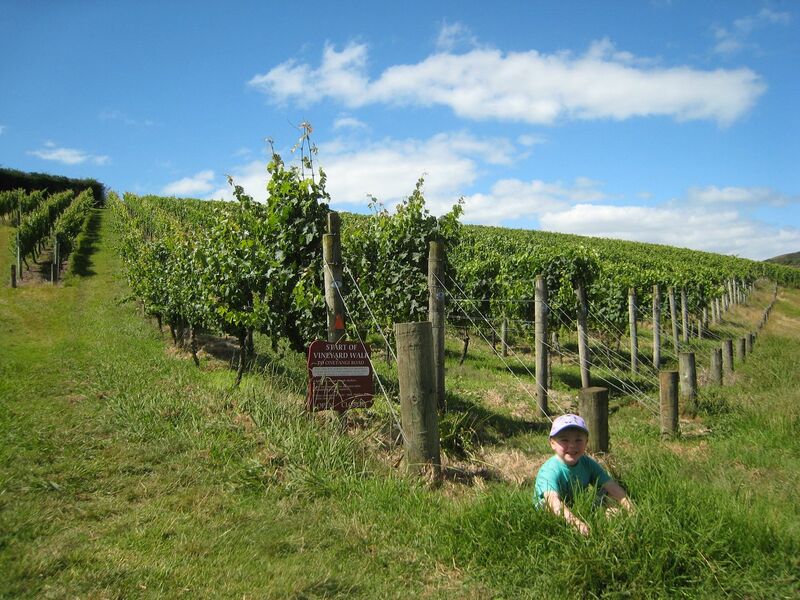 Hugo got into the spirit of cellar door visits by sniffing wines - although he tended to described white wines as smelling like "wee-wee" (which is probably accurate for some North Island sauvignon blancs), Hugo became quite good with red wines. 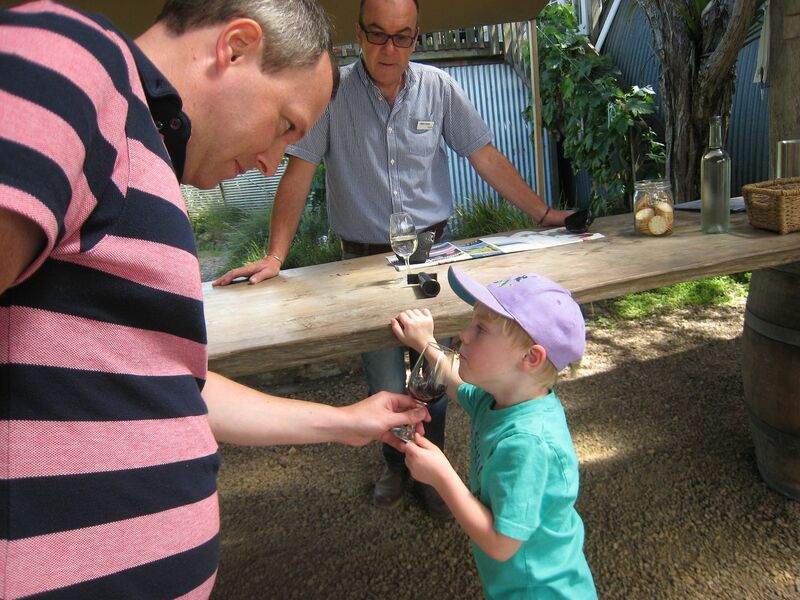 At Black Barn in Hawke's Bay he described their malbec as smelling like "plums" and their rose as "strawberries"; unfortunately he then let himself down by saying their top red smelt like "poo-poo". 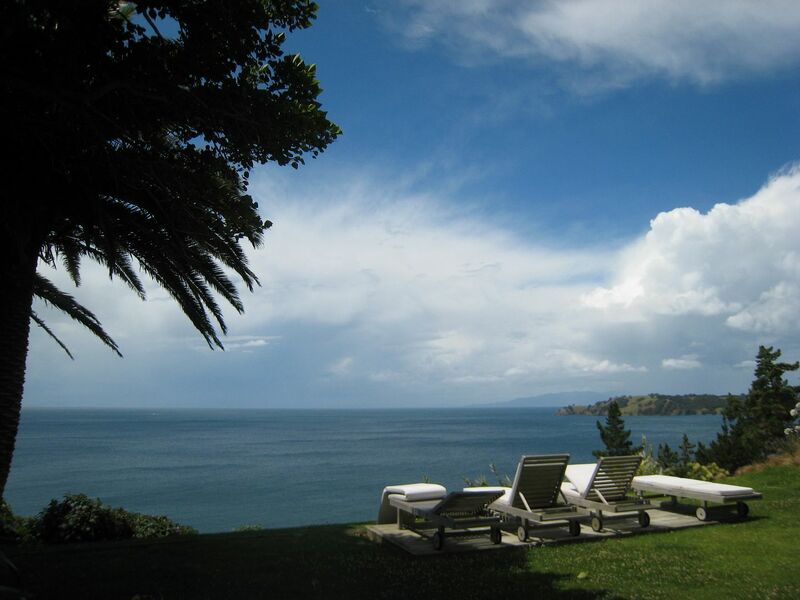 Anyway, for those who are interested in such things, wine highlights were as follows: Cable Bay "Five Hills" 2006; Yealands Estate Gruner Veltliner 2012; Elephant Hill "Airavata" Syrah 2009; Ngatawara Stables Reserve Sauvignon Blanc 2013; Esk Valley Reserve Syrah 2006; Palliser Estate Sauvignon Blanc 2013; Clearview "White Caps" Chardonnay 2012; Villa Maria Single Vineyard Taylors Pass Sauvignon Blanc 2013; Villa Maria Single Vineyard Southern Clays Sauvignon Blanc 2013; Sileni "The Peak" Syrah 2006; Te Mata "Coleraine" 2007; Fromm Clayvin Vineyard Pinot Noir 2005; Kennedy Point "Cuvee Eve" Chardonnay 2013; Passage Rock Reserve Syrah 2010; Man O War "Ironclad" 2009; Gibbston Valley Pinot Gris 2012; Trinity Hill Touriga 2007; and anything by Craggy Range.